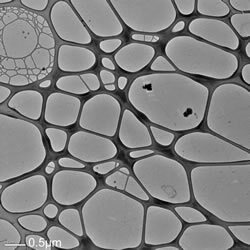 The graphene film appears as a near-transparent to light-grey film on the surface of the red-brown microporous copper TEM grid. For support, the TEM grid is attached using epoxy to a gold-colored beryllium-copper disk with a 2 x 1 mm aperture. 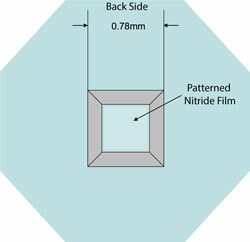 The Ultra-flat Thermal SiO2 Substrate consists of a 200 nm thermally grown SiO2 film on an ultra-flat silicon wafer with a normal thickness of 675 µm. The size is 5 mm x 5 mm.